Esma Sultan luxury gulet was launched in 2008. 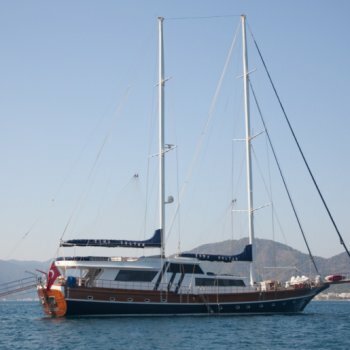 This luxury gulet for charter was designed 37 meters in length and provides 7 guest cabins for 14 passengers. 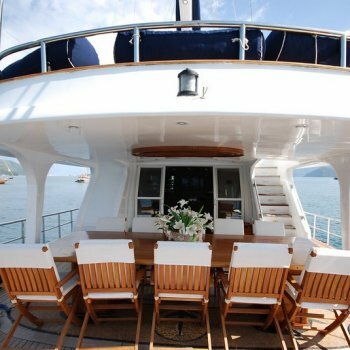 This wood hulled luxury charter yacht in Turkey, carries a crew of 6 for those superb Blue criuse yacht charters in Turkey and Greece. 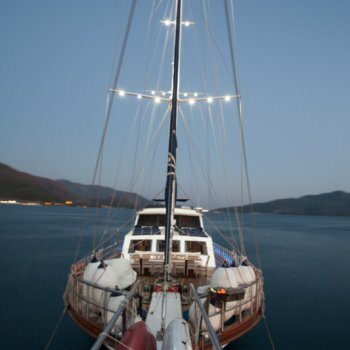 Whether you are seeking for a gulet charter holiday in the Greek Islands or wish to experience the Blue voyage along the shores of Turkey, the Esma Sultan will aim to please during your yacht charter holidays. Master cabin with jacuzzi, 4 double and 2 twin guest cabins for 14 guests. All cabins with ensuite facilities, sat TV, music system. All beds queen size. Twin cabins with 1 double and 1 single bed. 4 crew cabins with separate companionway & deck. Waterski, Ringo, Canoe. Snorkelling equipment, Fishing tackle. CD Player and DVD Player. TV in saloon and all cabins, satellite system. Spacious main salon with dining for 14 on foredeck and another salon on aft deck. Jacuzzi on Flybridge. Sun awnings, Sun mattresses, Deck shower, and Sea ladder. Ice machine and Filter coffee machine.